Since our post featuring our cage setup, we pigs have had some interest in the type of bedding we use. Increasingly, more guinea pig owners are choosing to turn to alternative bedding. We switched from traditional bedding (wood chips and Carefresh) to fleece bedding a bit over a year ago. 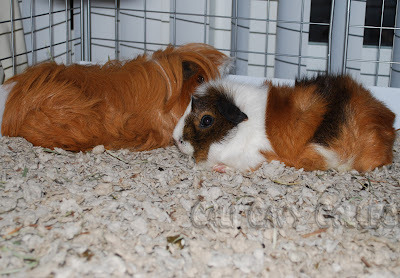 Fleece bedding is a layering combination of fleece fabric and towels. In traditional wood chip or paper bedding, a piggy's excrement soaks and mixes into the material, which remains damp. In contrast, properly prepared fleece bedding allows the urine to pass straight through the fleece, so the piggy's bottom and the top layer remain dry. 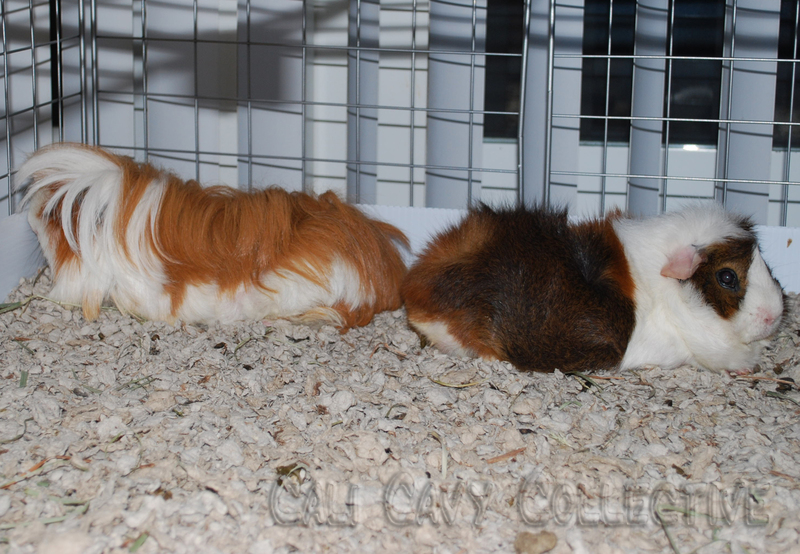 Towels placed underneath the top layer of fleece absorb any liquids that pass through while piggy poops remain on top. The fact sheet also summarizes the drawbacks to using fleece bedding. We don't find any of these to be a significant problem and believe the benefits far outweigh any minor inconveniences. 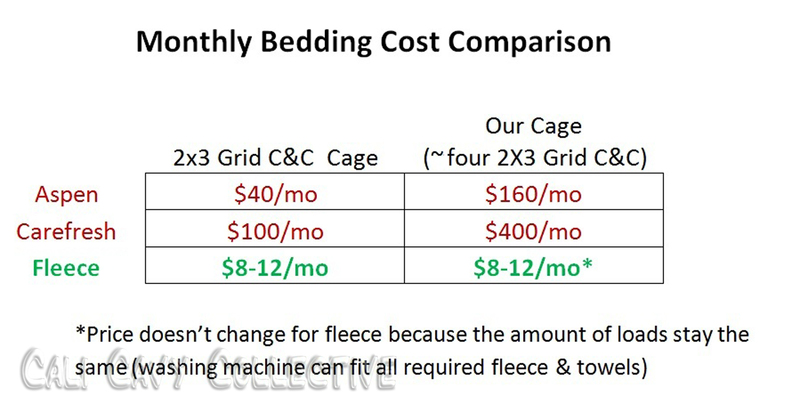 For a simple 2x3 grid C&C cage, bedding needs to be changed on average twice a week. A 60 liter bag of Carefresh costs about $25. Each change uses about 1/2 a bag. So each 2x3 enclosure needed four bags of Carefresh, which costed our humans about $100/month. Our current cage size is an equivalent total of four 2x3 enclosures. If using Carefresh, this would mean a total of $400/month. 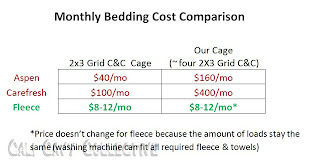 Carefresh is the most costly traditional bedding to use. For example, aspen bedding costs about $10 for 60 liters. With our current cage size, this would cost a total of $160/month. Fleece bedding should also be changed and laundered at least twice a week. Since fleece is reusable, with each changing you only pay for the cost of water, electricity and detergent. At our current location in California, it costs $0.91 per each load washed and dried ($0.13/kw electricity, $0.14/load of detergent, $4.00/1000 gallons of water, and $1.00/therm). Since the cage should be changed 8-12 times per month, the total cost is $7.28-10.92/month for our current large cage. What a great opportunity to save money to use towards piggy toys and cage accessories instead! Keep an eye out for our next post about fabric selection and preparation. is fleece better than newspaper , hay and kitty litter ( separately)? 100% polyester fleece, ideally anti-pill. C&C cages are fairly straightforward to put together. Search on Youtube for "how to build a C&C cage for guinea pigs", there are quite a few helpful tutorials there.